We released a flange case type halogen point heater. We propose a burning method with good responsiveness. We propose a method of uniform heating. We introduce a method of non-contact heating which is stable at low temperature. We propose a method of stable glass heating at low temperature. We propose a method of non-contact heating which is precise at low temperature. there are many difficult themes for consultation of our heating. There is the thing which a lot of the highest processing method and new material cannot solve by the past data. In many cases, we recommend the experiment in the test laboratory as we do not understand. It can be confirmed how it’ll be the heat-treatment customers wish if it’s heated, by a test laboratory. 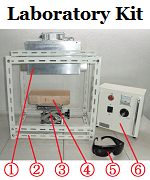 Application for test laboratory can be processed at the following site. ■ To cancel your subscription, please enter the registered email address in the Cancel Newsletter sign-up space provided and click Cancel. ■ The termination procedure later, the newsletter is doing the delivery already prepared, there are times when it is delivered. ■ Please contact us at the following address opinions and requests to this email. * Are subject to change without any prior notice that it is provided. * It is strictly prohibited by any means without prior permission to duplicate on an article published in Heat-tech News Letter, to reprint. [Published by] Heat-Tech Co., Ltd.